By Telephone: Call the Rep Box Office between 5pm and 8pm on (01782) 209784 from the Monday prior to the First Night. Visa, Mastercard, Delta and Maestro cards are accepted. Open Monday to Saturday 9.30am to 5,30pm. Students/School Children £7.00 any performance. Save money with a season ticket: (Repertory Players' Productions only). Season Tickets cannot be purchased for any Saturday Matinee performance. We regret that the cost of unused or returned tickets cannot be refunded. Tickets can be exchanged for another performance or play staged by the Repertory Players within that season. There is a charge of 50p per ticket for exchanges on standard priced tickets. There is no charge on exchanges for Season Ticket holders. 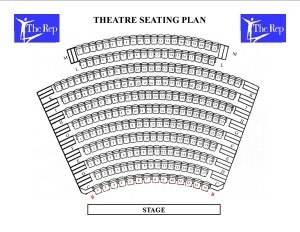 When Booking - Please be aware that the Auditorium is steeply raked. Row B which is on ground floor level and is purpose built to take wheelchairs. Latecomers may not be admitted until a suitable break in the performance in order to avoid distracting other patrons. Did you know that a night at the theatre could help to raise valuable funds for your charity? The Rep offers registered charities the opportunity to obtain tickets for any performance and to keep a percentage of sales. Interested ?